Its hard to come to Ketchikan in the summer and NOT see Pink Salmon jumping out of the water right and left. They start to trickle into our area at the end of June and for most of July and August they can be seen swimming in large schools near the surface and jumping out of the water very regularly. They average between 4-7 pounds with a trophy size fish being in the 10+ pound range. The real advantage of fishing for Pink Salmon in Ketchikan is that there is such a large number of them available that if you are looking for some fresh salmon to take home with you, most days you can fill the icebox up with Pinks. At almost any moment in July and August you can catch numerous pinks very close to town, which makes Ketchikan and ideal spot to fish if you are in a time crunch. The easiest way to describe Pink Salmon is to imagine a hyperactive fish, or one that is on a major sugar/caffeine buzz and you’ve got a pretty good idea of what a Pink acts like. They are very fast swimmers and when you catch them in the ocean (as opposed to later in their life-cycle when they are in a fresh water stream) they put up an incredible fight. 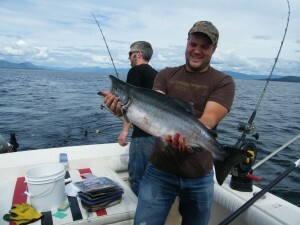 Pound for pound, I believe that a small (3-4 pounds) female pink salmon is one of the best fighting fish around! Pinks will do lots of short, fast runs and small jumps when you are fighting them and they do lots of quick darts side to side in the water. It seems like they never really sit still until you give them some sedative (a firm knock on the head) and even then, they have been known to start flopping in your ice-box an hour or two after you thought they were dead. 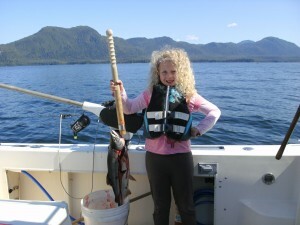 Are you ready to come fishing for Pink Salmon in Ketchikan? Contact us now to set up your trip for you!